“Arise, awake, and stop not till the goal is reached.” If Swami Vivekananda was still around, he might have repeated those famous words to get us to deal with air pollution. 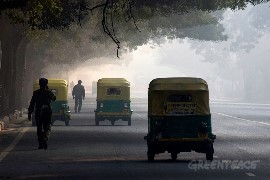 Delhi has been choking on toxic air, and alarmed residents want solutions. Our leaders and officials have started scrambling around to find quick remedies. Even the courts are having their say in the matter. 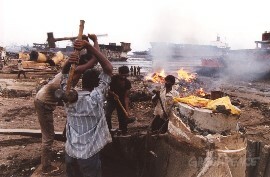 And yet, all of us know that the air pollution time bomb has been ticking for many years now. 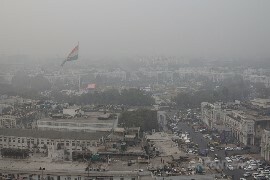 In 2014, a WHO report declared Delhi as the most polluted city in the world, and recognised air pollution as the fifth largest killer in India. An aspiring world leader, India should never have waited to hear that from the WHO, but what’s worse is that even that wake-up call did little to galvanise our leaders and citizens. Like everything else, air pollution hurts vulnerable people the most – children and the elderly for instance. In February 2015, Greenpeace India carried out an air quality monitoring survey in five schools in Delhi, which showed that PM2.5 levels were 10 times more than the safe limits prescribed by the WHO. At the very minimum, this means impaired lung functioning and respiratory problems in children. Two months later, the Central Government belatedly launched the National Air Quality Index (NAQI). Earlier this year, the WHO released fresh data showing that of the 20 most polluted cities in the world, 10 were in India. Gwalior, Allahabad, Patna, Raipur, Ludhiana, Kanpur and many other cities now made it to the list. Delhi had moved from most polluted city to the 11th most polluted city and this was interpreted by many media reports as an ‘improvement’, ignoring the fact that a large number of Indian cities were in the top 20, never mind others further down the list. This false sense of achievement has fortunately dissipated with this month’s renewed crisis in Delhi. We launched our Clean Air Nation campaign in September 2015. We have released several reports that clearly show that the crisis in not limited to Delhi but covers the entire Indo-Gangetic Plains. Other regions and cities are not far behind. We have pointed out the current limitations of the NAQI. We have highlighted the large role of thermal power generation in causing air pollution, and we have shown exactly how and why even China is doing so much better than us. Our campaign is stepping up and we need more people power in order to win. We need citizens all over the country to join us in large numbers. This is a nationwide problem and requires concerted action. Our demands to the government are clear. First, fix the gaps in the NAQI and make real time information widely available all over the country. We need to know the quality of the air we are breathing and what’s making it toxic. Issue health advisories when the air is bad; tell us what precautions we need to take to reduce the worst impacts. And next, more importantly, come up with a lasting solution. Address the root causes. Draft a comprehensive National Clean Air Action Plan to tackle all sources of pollution in a time-bound manner, in all regions of the country. Clean air is our birth right. Our children deserve better. Sign our petition – let us join hands to shape a healthy future for our country.